If you subscribe to Ray Jardines ultralight philosophy – you don&apos;t really need these. You should just plough ahead and do stream crossings in your hiking/tennis shoes – get them soaked – and let them dry out over the next few hours. However, If I know the trail will be mostly dry, except for a few stream crossings – I would rather take a little bit of a hit – and get across the water with dry feet. 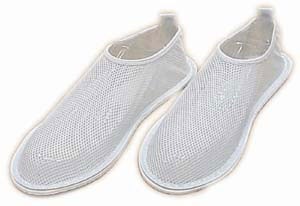 I&apos;ve tried sandals, neoprene socks etc – and while not the most stylish option (be prepared to be laughed at), these nylon mesh shoes are a great balance between some sole-protection and minimal weight penalty. Ignore the sizes. I wear a men&apos;s 10 and I can JUST fit into the large size – no way I could get into the medium. Theresa has the small at 1.5 oz. I have the large at 2.1 oz. Available here at Sprint Aquatics, for a whopping $4.95. 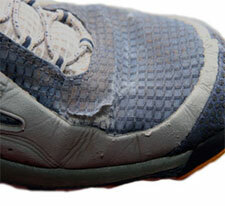 This entry was posted in Backpacking, Footwear, Gear Reviews on May 30, 2008 by brett. GoLite responded to my customer service inquiry about their Sun Dragon shoes. The general manager responded to my post and pointed out that the first production run used a fabric treatment that left the uppers somewhat brittle. This is very consistent with my first impression of the shoe – the fabric seemed somewhat stiff and thin – and (with hindsight) probably prone to tearing. I&apos;m going to take them up on the offer and exchange them for a different pair with the new uppers and will report back. I hope they work out – as I really want to keep these shoes! You can read the full response in the comments section of my previous post. This entry was posted in Backpacking, Footwear, Gear Reviews on October 29, 2007 by brett. I bought these GoLite shoes a few months ago, and wrote a very excited and optimistic post about them. I hiked a grand total of 3 hikes in them: a quick overnight to Kendall Katwalk, a day hike to Annapurna in the Enchantments, and the West Coast Trail. Comfort and trail-use wise they performed really well. As I said in my first post – they are amazingly comfy and had excellent traction on a lot of terrain. However, durability wise, they were appalling. I&apos;m amazed how badly they appear to be falling apart after a total of 7 days on trails. Read on for more pictures of the damage. This entry was posted in Backpacking, Footwear, Gear Reviews on October 25, 2007 by brett. Wow. No, really – wow. I don&apos;t think I have ever put a more comfortable shoe on my foot. Not even big furry slippers. These fit like a glove and it feels like I&apos;m walking on springs. 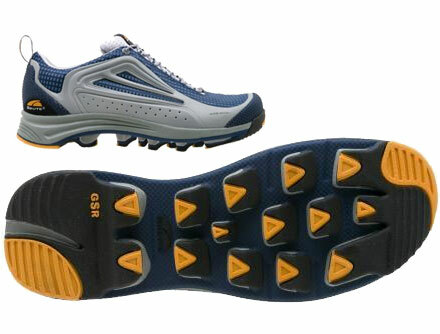 The GoLite Sun Dragons have been getting all sorts of interesting reviews – most notably for the crazy new suspension sole that was co-developed by GoLite and Timberland labs. Available from Backcountry Gear for $95. 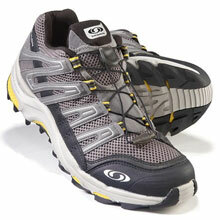 Suprisingly REI is starting to stock GoLite gear, and has these shoes in stock. I went to the Flagship store in Seattle recently and tried a pair on – I was sold. I wore them for a week to work to try and break them in – they really didn&apos;t need it. However, I did feel quite weird walking in them for a while – it&apos;s hard to describe but somewhat loose and bouncy. I took them up Kendall Katwalk for a quick overnight this weekend and they performed really well. I submerged my feet before starting the 7mi hike down to see how well they would dry out. Not bad – they were moist still after 3 hrs, but dried reasonably well. REI was a terrible place to buy these. The guy that sold them was clueless about how they worked (they have a special insole that adjusts to your feet that doesn&apos;t take a rocket-scientist to figure out) and was adamant that we could not possibly think of doing the WCT in these shoes. They got quite a bad review by Raymond Estrella, as they started to fall apart after 5 days of use. So I&apos;m curious to see how they hold up. I&apos;ll report back after the WCT trip with my findings. This entry was posted in Backpacking, Footwear, Gear Reviews on August 8, 2007 by brett. Theresa uses the womens version and is quite happy with them. See my review on the mens pair for more details. This entry was posted in Backpacking, Footwear, Gear Reviews on September 10, 2006 by brett. When it pours down, with my old nikwaxed leather boots, I found that after 3-4 hrs of rain, (no matter how great the "goretex lining") the things get miserably wet – either from water coming in the top or sweat build-up inside. With my trail shoes, my feet also get wet, but I&apos;m quite happy trotting along with soggy feet – the mesh is super breathable so I don&apos;t experience much discomfort and after several hours of the rain stopping my shoes have dried out already. No building a big camp-fire to try and dry out my boots at the end of the day. The stock insole that comes with these is pretty lame. I tried to put a super-feet in there, but it rode to high for me. I ended up using some insoles from an old pair of snowboarding boots with good arch support – they work great. Oh – one more thing – I&apos;m sure there are isolated cases, but in general, I beleive "ankle-support" to be a myth. Sure if you&apos;re carrying a 60lb pack, you might need it, but with small loads and trekking poles at hand to catch the odd slip, I have never been in need of anything more substantial. 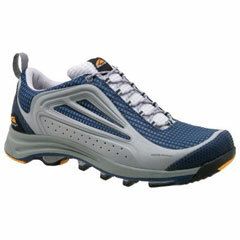 Salomon Shoes from Amazon for $80. And here&apos;s me thinking a sock was just a sock. Not so! In the old days, I used to wear a big thick pair of wool socks with a thinner sock liner, stuffed into my big heavy leather boots. Death by blisters is not my chosen way to go. 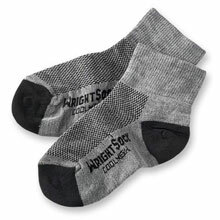 This socks weigh only 1 oz., and are &apos;double layered&apos; meaning they have a liner built in. 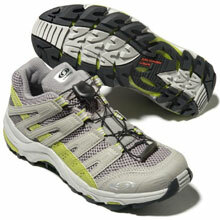 They work great with my trail running shoes to keep me moving on the trail. I have to take atleast 3 pairs, as I find my trail running shoes let in a lot of dust from being open-mesh. By the end of the day my toes are black from grime and the socks as a little worse for wear. Nothing a field-wash won&apos;t take care of, but I like to make sure I have a good day to get them dry again. Cool Mesh Socks from REI for $8.50. This entry was posted in Backpacking, Clothing, Footwear, Gear Reviews on September 10, 2006 by brett.